Duncan and Joss Weir in their Okoroire asparagus paddock. Their excitement is obvious as green-fingered couple Duncan and Joss Weir settle into their new Okoroire lifestyle block. Not only does it mark the end of a two-year search for a suitable property, but the beginning of their retirement dream. 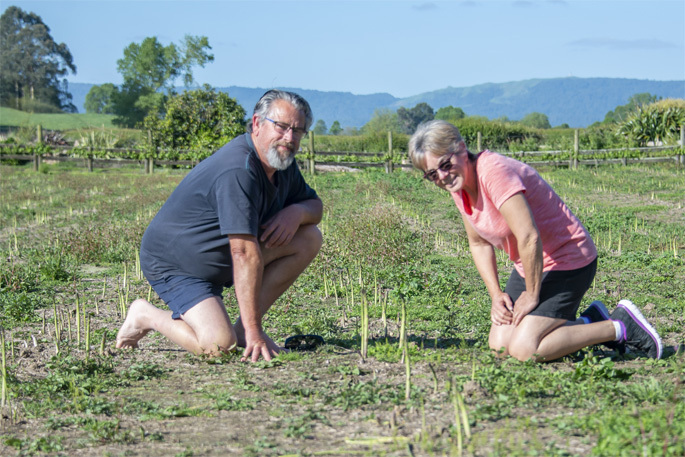 It’s quite a lifestyle change for the city-dwellers from Tauranga, but both have always wanted go rural, and get back to working and living off the land. Duncan has previously worked in a cut flower nursery and “dabbled” in miniature roses. And while he’ll remain in the tech services advisory role he’s held for the last 30 years, Joss has left her administrative job at a Tauranga secondary school and is taking the lead role on the home block. “We’d been looking for two years, far and wide across the region, anything from freerange chicken enterprises to hydroponics, so we were very well researched,” says Joss. The three-and-a-half acres, with a lovely 1940s farmhouse, ticked all the boxes. “We’ve never moved so fast!” says Joss. “We saw it on a Friday, again on the Sunday and had a contract on it by the Tuesday. Ten days later we were unconditional,” says Duncan. Part of the attraction was the established asparagus paddock that was already bringing in a modest income. The previous owners had everything in shape for potential buyers, and spent three weekends giving Duncan and Joss a crash course in asparagus growing, as takeover would be in the picking season. “We moved in on a Saturday and have been picking ever since,” says Duncan when Coast & Country News visited in November. “Although we’re new to asparagus, Duncan had a very good knowledge of horticulture to start with, and has picked it up fast – and I learn from him,” says Joss. Asparagus is a relatively easy perennial crop, with an intense harvest season from September to December each year. The Weir’s crop requires four to five hours of picking and grading seven days a week during the picking season. “We have a fast turnover with product being sold within a couple of days of harvest,” says Duncan. It is sold at their gate, and at Rotorua Farmer’s Market under the name Front Paddock Asparagus. Only one acre is planted with asparagus, with another one-and-a-half acres of pasture, and the balance is domestic gardens and the house. The domestic gardens have an extensive orchard with numerous established fruit trees, large areas of vegetable beds, wire-enclosed vegetable gardens, and hundreds of metres of grapevines lining the asparagus paddock boundaries. This season they’re already growing tomatoes, potatoes and other vegetables. It’s early days for learning what the property is capable of. The final one-and-a-half acres is earmarked for another project. As the asparagus season ends, Joss and Duncan will be buying in around 75 red shaver 20-week-old hens on the point of lay. “Because of the time of year we’ve taken over the property, there isn’t time to grow them on from one-day-old chicks, but we’ll do that in future to replenish the laying stock,” says Duncan. “As our flock will be free-range and fed with good food, it mattered to us where the hens came from,” says Joss. The Weir flock will be sourced from a trusted free-range breeder. Currently, a suitable hen house, which can be turned around and moved in the paddock, is being organised. “The hens will be free-range, and rotationally grazed. We reckon we’ll be able to rest the paddock for around eight to ten weeks before the birds spend another week in each area,” says Duncan. The hens’ diet of a quality commercial chook food will be augmented by homegrown veggies such as silverbeet, and Joss is looking to experiment with fermented foods. “They’re more digestible when fermented, and much better for the gut,” says Joss. From late-summer until mid-winter, while the asparagus is dormant, the hens will be let in to forage, offering some “natural chicken cultivation” for the paddock. Looking at the bigger picture, Joss and Duncan are carefully using the land to its full potential. They work in different practices that complement each other, as naturally as possible, and also maximise production. A plan to grow hydroponic vegetables is also in the early investigative stage. “At some point in future we’d like to live and work on the property, and for it to support us financially,” says Duncan. It’s easy to see why Joss and Duncan jumped on this property, and their contentment and enthusiasm is infectious. Maybe we should all look at slowing the pace and going back to the basics of the land?